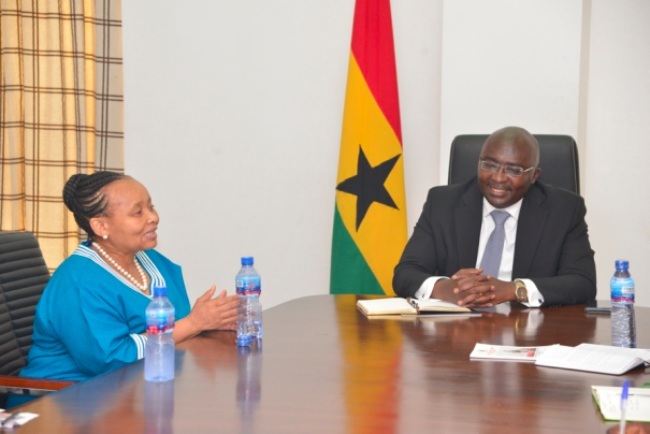 ACCRA — The South African Ambassador to Ghana, Her Excellency Madam Lulu Xingwana has expressed satisfaction with Ghana’s rolled-out digital property address system. Ambassador Lulu believes Ghana’s digital address system is innovative and shows Ghana’s readiness to leapfrog its technological drive for rapid economic development. At the meeting, Vice President Dr. Bawumia took the students and academic leads from the Wits Business School (WBS) through the mandate and operations of the Economic Management Team (EMT) and the Presidential Delivery Unit (PDU). The Vice President also touched on how policy decisions are made at the appellate level of government at the EMT and devolved for implementation. Key among the highlights made by Vice President Dr. Bawumia were the steps Ghana is taking in the area of economic formalization through digitization. He expounded on some projects such as the digital property address system, national identification, mobile money interoperability, land records digitization etc.